3ptechies » Design & Development » Other CMS » Link Spamming, Bots Registration on SMF Forum: How I Stopped them! At last, I managed to figure out this new and improved method I used to completely block link spamming and prevented spam-bots registration on my SMF powered forum. Every webmaster hates Spam, no doubt about that. Spam-bots has long remained the greatest problem of every webmaster, this is the reason why user’s experience is now taken as a second priority in most popular forums. Either there is one difficult to solve CAPTCHA there or one other complex question to answer before you can become a member of the fora. There wouldn’t have been need for all this CAPTCHA in the first place, if not for the harm caused by the activities of this spam-bots. From posting nudes and unacceptable contents to advertising several useless services on your forum, these spammers will not stop but strive to drag down your website or leave them in the dustbin of Google’s tenth page. We, having had a first hand experience of bots-registration and post link-spamming in the past have taken it upon ourselves to provide you with the 3 methods we used to combat spammers and spam-bots registration on our Simple Machines (SMF) Software powered discussion board. Since the new improved method we are introducing to you is already going to put to a halt, the activities of human spammers and that of spam-bots, I really do not see any need of the default SMF CAPTCHA, after-all it didn’t stop them in the first place. If at all, you are still insisting on using a CAPTCHA to border the experiences of your forum users (where PM & searches goes with a compulsory verification), then reCAPTCHA for SMF Mod must be used, this is because many of the free or cheap spam-bots around can get around the system yet. Even if they happens to get around the Google’s owned reCAPTCHA engine, there is certainly a future hope of Google fishing them out and implementing an update that takes care of that backdoor. As stated earlier at the beginning of this article, we have managed to put the sledgehammer to the antics of spam-bots and human spammers with the help of the following Mods and methods. A time gate on registration to prevent overly quick registrations from being accepted. With this method requiring users to empty out a field, bots can hardly get through ‘cos they are going to have two fields to battle with. 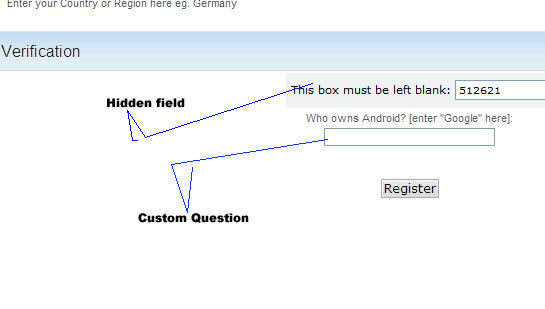 Most of the time, this field is hidden from users, the spam-bots are required to empty out one field and to also ignore the already emptied field. Surely this is really a herculean task for any lily-livered spam-bot to do. You have learned about the methods we implemented to have spammers and link-building robots put in check and how we managed to reduce automatic spam-bots registration on our forum to zero. It is now left for you to share, contribute and drop your comments stating what has worked for you in the past as well as what doesn’t work for you any longer.